Pocahontas State Park's mountain biking singletrack trails are built and maintained by volunteers and supported by funds raised through our wood-splitting program and other fundraising activities. They are the largest all-volunteer-maintained trail system in the region. Every year, our volunteers spend many hours maintaining the trails during trail-work days. You can help by volunteering your time, donating money to the Friends of Pocahontas' Trail Fund and by staying off the trails during wet conditions (please let the trails rest for 24 hours for each inch of rain received in a single day). Trails are not natural features - they're designed, built and maintained by skilled volunteers and trail staff. You can learn how to build great sustainable trails by volunteering for our trail work days and signing up for trail classes when offered. The best things about Pocahontas Trails is the back country experience they offer. To enjoy these trails safely, always let someone know when you'll be riding, only ride trails within your ability level, wear a good fitting helmet and carry a snack, plenty of water, and a cell phone. And also important, always practice good trail etiquette by following the "Rules of the Trail". In 2015, the Pocahontas trails will be added to and incorporated into the IMBA Richmond Regional Ride Center. Find out how you can support these new trails. ﻿These were the original, volunteer-built trails developed in the mid 1990s by a hardy group of committed cyclists. The trails system consists of three trail loops each running between 2.5 and 4 miles in length. The trailhead is halfway between Qualla road and the Heritage Center parking lot on the Crostic Trail. From The Horner Forest Road Parking Lot, the trails can be accessed by following the bidirectional trail that leads out of the NE corner of the lot (Qualla Connector trail). When you reach the Crostic Trail (a fire road) you have the option of crossing directly and entering the green/blue loop or turning right and riding to the trailhead which is about half way down the trail on your left. From Heritage Center parking area, follow Crostic (the gated fireroad immediately to the south of the parking lot) to the trailhead on your right. It is worth noting that, apart from the Horner Forest access trail and the Lakeview access trail, all of our mountain biking trails are one-way directional (for safety). Please do not ride in the wrong direction - other cyclists will not be expecting you. The outermost loop is the easier trail, named Box Turtle trail. This trail is marked with a green circle and has moderate climbs and descents, no water crossings, no log crossings and no rock gardens. While probably not rideable by very small children learning to ride, the trail is a great "first" ride for most users new to mountain biking. For those with a little more ability, check out the two large exposed rocks that are great for practicing your trails skills. They're about 2/3 of the way along the trail on your right. You can find the Green Trail on Strava here. Inside the "green" are two more difficult trails. The Tall Oaks trail ("blue"), an intermediate trail marked with a blue square, has somewhat steeper climbs, some rock gardens, several small logs and rooty sections and some steeper, shelved declines which might be intimidating to new or younger riders. The more difficult Morel Ravine ("red") trail, marked with a red square, loops from the trailhead access trail through a ravine area. It announces itself with a berm right at the start followed by a rocky table top and an uphill log. If these all seem like fun things to play on, you're in the right place. If not, now might be a good time to turn around and head back to the blue. One of the best features of this trail are the ravine crossings which start off with dips of just a couple of feet and end up with steep, rooty "halfpipes" 12 to 15 feet high. And then there's "Little West Virginia". Two thirds of the way along the blue trail, there is a short section of expert level trail which we like to think of as a slice of West Virginia back country riding right here in Richmond. On this relatively short but intense loop you will have lots of drop offs, some small jumps, large log overs and crossings, technical climbs, rock gardens, and lots and lots of logs to hop over. The action just keeps coming and coming with very few breaks. This is definitely not a place to ride alone or to learn to ride. We love our singletrack trails but there's far more to ride here than just the 23 or so miles in those systems. Pocahontas has more than 50 additional miles of fire roads and doubletrack, mixed use trails. With so much variety, you can ride all day, all weekend or even all week. The best places to ride are the long loop trails on the north and south sides of the park. Stop and announce yourself by saying "hello" to the horse's rider. Pass the horse only after the rider has acknowledged your intentions. Never pass a horse from behind without following steps 1 and 2. 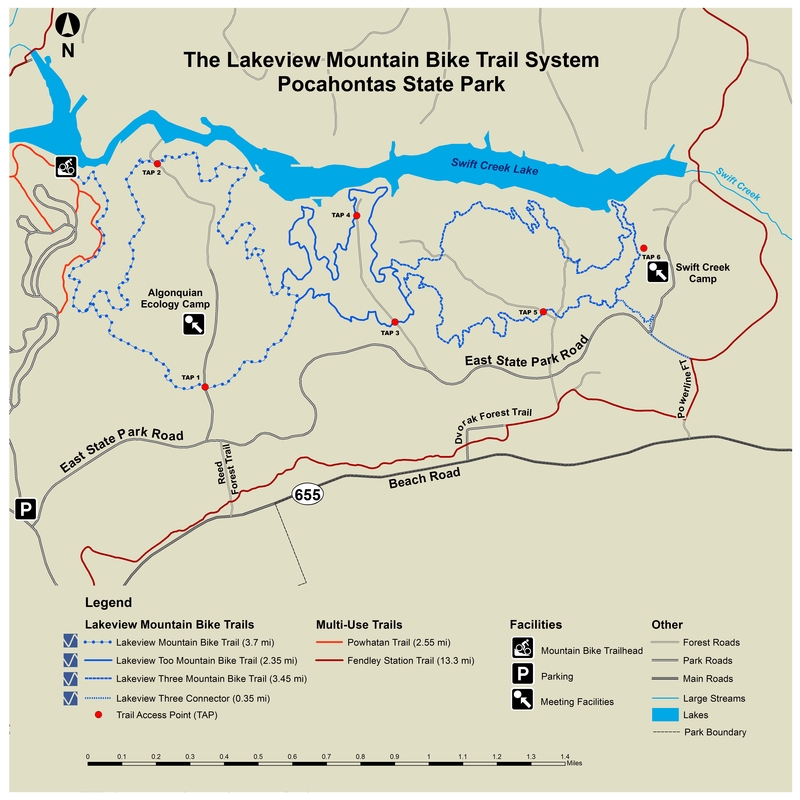 Our second volunteer-built mountain bike-specific trail system is the Lakeview system of predominantly intermediate trails. Connected like loops in a chain, the trails offer stunning views of Swift Creek Lake and up to 12 miles of continuous riding over a fairly consistent level of difficulty. Because all of the trails return to the same spot on Lakeview 1, riders can enjoy just a single loop of loop 1, loops 1 & 2, or the full course, or they can repeat any of these combinations to create a ride of almost any length they desire. To get to the Lakeview trails, park at the parking lot next to the Civilian Conservation Corps Museum. Follow the Old Mill Bike Trail (to the left of the CCC Museum, across the bridge and up the hill to your left until you reach a road crossing. After crossing the road, bear right and then take a hard left on the Powhatan Trail until you reach the blue trail marker pointing to your left. Follow that trail until you see the entrance to the single track on your left as you climb away from the lake. Because these are intermediate trails, expect to experience a creek crossing, lots of small logs, some exposed rocky shelves, some basic rock gardens and a lot of climbing and descending. Expert offshoots add more rocky features, log skinnies, jumps and some technical, bouldered sections. Without including the more difficult (red or black diamond marked) offshoots, Lakeview 1 is roughly a six mile loop from the Heritage Center parking lot. Lakeview 2 extends this to about 8.5 miles and Lakeview 3 extends it to a total of 11.5 miles. Other than the initial access trail all of the trails are one-way directional, clockwise. The trails are ideal for fast riding and get a lot of traffic, please do not ride in the wrong direction. Our newest trail system, completed in 2015 includes four machine cut trails, designed specifically for use by hand-cyclists and beginners. Accessed from the Loop Forest Parking lot off Courthouse Rd, near the 288 exit, these trails offer a new trail style not found in the region. True beginner level trails, these two unidirectional 1/2 mile long trails are separate loops, near the Loop Forest Parking lot. Each of these trails is built in a "lift & tilt" fashion offering a raised trail bed, wide enough for hand-cyclist, but also a great trail for kids and beginners. This trail is a 4.5 mile uni-directional loop, which begins and ends at the Swift Creek trail hub. Access to this trail is on the right, just past Gateway 2 trail. A lift & tilt flow style trail and also built with hand-cyclists in mind, this trail is fast and fun. Follow the trail along the contours of the park but watch your speed as there are several trail crossings. There are many banked turns and rollers that will put a little air between you and the ground if you carry some speed. The first half of the trail is mostly downhill and will carry riders near Swift Creek Lake before returning on an uphill section back to the trailhead. The downhill section of this flow trail was designed and built by IMBA's Trail Solutions with funding donated by Bell Helmets through the Bell Built program. This is a unidirectional flow trail, with rollers, berms and lots of twists. Access to this trail can be found at the Swift Creek trail hub, near the Blueberry entrance/exit. Riders are encouraged to lower their bike seat for the best experience on the downhill section. The trail intersects the Loop Forest trail and riders can choose to take a left to return to the top via the gravel trail or take a right and return via a singletrack trail, back to the top of the trailhead. 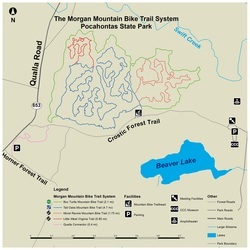 Completed in 2018, the trail known as Corkscrew is an intermediate level downhill oriented pump style trail featuring many twists and bermed turns that will provide a fast paced challenge to any rider. Some BMX bike riders may find this trail to be a great crossover trail to mountain biking, especially when riding bikes with 26" wheels or shorter wheelbases. The entrance to Sunsetter trail begins immediately at the end of Corkscrew near the banks of the Swift Creek Lake. This trail features a gradual climbing track that seamlessly follows the contours of the land, with several creek crossings and rock outcroppings and great views of the water (especially at sunset!). The finish of the trail meets a fireroad directly across from the ascending section of the Bell Lap trail.